Manage all of your training evaluations online – no paper required. Use your program's custom evaluation forms. Use Time2Track to send out custom competency evaluations that reflect your program’s goals and objectives. Send out evaluation forms electronically. Send out competency evaluation forms to students and supervisors directly from Time2Track. Students and Supervisors complete their evaluations online, so the status and responses are automatically tracked and reported back to you inside Time2Track. Form responses are stored in a secure database (no manual data entry required), so reporting is a breeze. Our program began requiring Time2Track a couple of years ago, and it has been an amazing timesaver for our program. 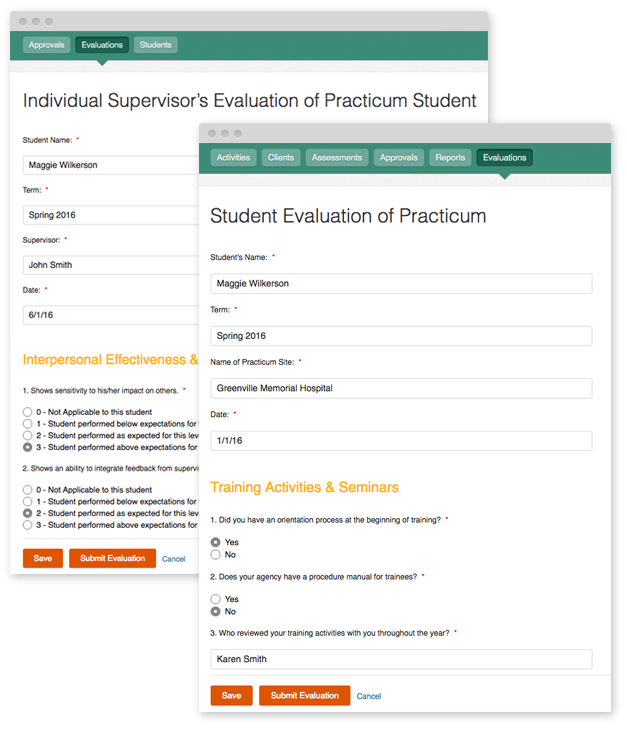 We worked closely with Time2Track to create online evaluation forms for our students’ evaluation of the training sites and our supervisors’ evaluation of our students. It has cut down on tracking people down for paperwork and allowed me easier oversight and real-time access to feedback from supervisors. I highly recommend this feature and look forward to easier manipulation of training data by abandoning our hand tallying system! Schedule an Online Evaluations Demo for Your Clinical Training Program Today.